Brockwell lace Vest. WHITE STUFF CLOTHING! They are all UK size 10. Or label specifying SAMPLE! UK size 10. Pretty Tunic in Plum with White Allium design. Length from shoulder to hem is 32". Drop waist giving large peplum effect at bottom. Gorgeous White Stuff Cream Green & Pink Floral Print Shift Top Size 14. Good Condition. beautiful lace edging on hem and sleeves Single button fastening on back Condition is Used. Dispatched with Royal Mail 1st Class. 32% nylon, 31% acrylic, 29% wool, 8% angora. Pit to pit 19". From top of shoulder to hemline 33". Good Condition. Great top in good condition. Lovely Preloved Whits Stuff Top, size 12, side tie tassels, in good clean condition. Lovely White Stuff palm print top. soft cotton. 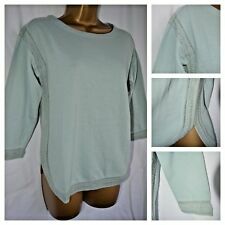 White Stuff Long-sleeved Linen Top in Duck Egg Blue Size 12. Bottom and neckline edged with duck egg and cream spotted fabric. Sleeves also roll up and so can be worn three quarter with bottom tie to hold into place. 100% linen. 36” length and 36” chest. very good condition. fabulous for the summer. From a pet free, non smoking home. Happy to combine postage if more than one item is purchased. Happy bidding and please see my other items for sale. Length from shoulder to hem 25". Two small button detail at front of neckline. SO GRAB A REAL BARGAIN. HAVING A HUGE FAMILY & FRIENDS CLEAR OUT. REAL BARGAINS. LOVELY WHITE STUFF LUSH TOP TUNIC MUSTARD LIME LINEN LACE BRODERIE SIZE 14 . Condition is Used. Dispatched with Royal Mail 1st Class. WHITE STUFF ESSENTIALS SUMMER TOP. SEA GREEN. 100% COTTON. SIZE 16. White Stuff Essentials 100% cotton summer top. Size 16. Colour is a lovely sea green. Scoop neckline with decorative border and little gathers to centre front. Measures approx 20 inches pit to pit and approx 27 inches shoulder to hem. From smoke free home. 100% feedback. 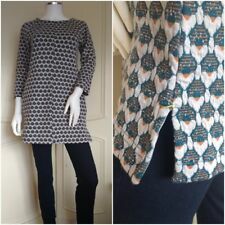 LOVELY "WHITE STUFF" TUNIC, NEW. Gorgeous White Stuff T shirt style top for sale size 10. Ideal for the present sunny weather, can be worn with a variety of outfits. Has been worn but freshly laundered. Please look at all my photos and also my other listings. Thanks. Scoop neck. White Stuff quality. Condition is Used. Pretty White Stuff top. Very good condition. White Stuff top, size 14 dark duck egg blue with ivory and black floral pattern. Condition is Used. Dispatched with Royal Mail 2nd Class. White Stuff blue cotton t-shirt. Only worn once so in good condition. Looks good with shorts or jeans. White Stuff Tunic Size 14. Condition is Used. Dispatched with Royal Mail 2nd Class. From non smoking home. White Stuff Red Floral Print 'Holi Yay' Shirt Size 14. Good Condition. Great top in good condition. Womens White Stuff size 16 Pink /Purple stripped knitted Tunic. Fabric is prone to pilling & there is some under the arms by bust but can be easily removed. Very soft due to fabric content. Lovely vibrant colours. Perfect for those days over a long sleeve T when it's a little chilly. Condition is Used. Dispatched with Royal Mail 2nd Class.